, the second baronet of the family, of Roydon hall, East Peckham, in Kent, was born in 1597. His father, William Twysden, esq. was one of those who conducted king James to London, when he first came from Scotland, to take possession of the English crown, and was first knighted and afterwards created a baronet by his majesty. Sir William had a learned education, understood Greek and Hebrew well, and accumulated a valuable collection of books and Mss. which he made useful to the public, both in defence of the protestant religion and the ancient constitutions of the kingdom. He died in January 1627-8. 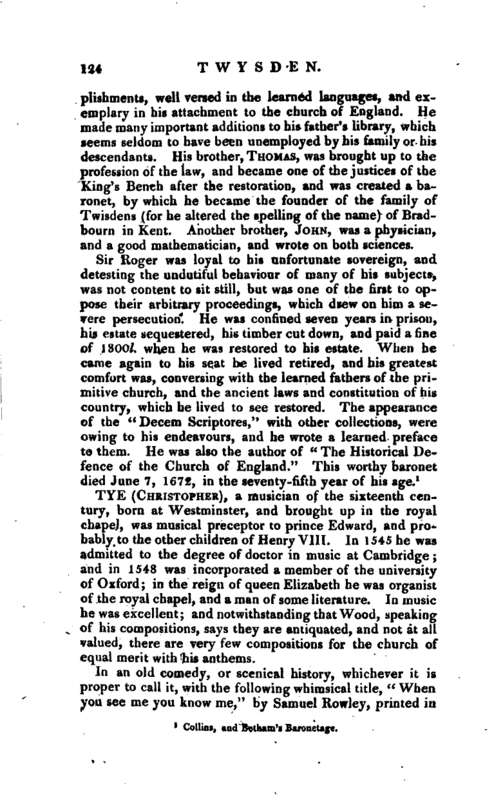 Sir Roger, his eldest son, had also a learned education, and was a good antiquary. 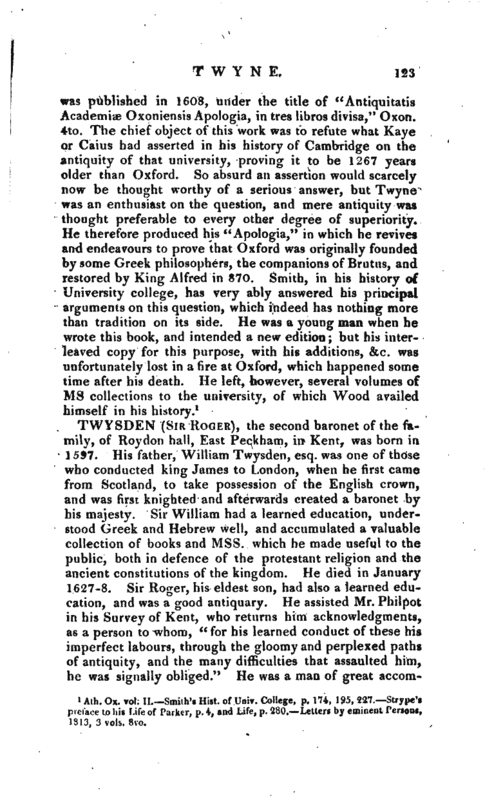 He assisted Mr. Philpot in his Survey of Kent, who returns him acknowledgments, as a person to whom, “for his learned conduct of these his imperfect labours, through the gloomy and perplexed paths of antiquity, and the many difficulties that assaulted him, he was signally obliged.” He was a man of great | accomplishments, well versed in the learned languages, and exemplary in his attachment to the church of England. He made many important additions to his father’s library, which seems seldom to have been unemployed by his family or his descendants. His brother, Thomas, was brought up to the profession of the law, and became one of the justices of the King’s Bench after the restoration, and was created a baronet, by which he became the founder of the family of Twisdens (for he altered the spelling of the name) of Bradbourn in Kent. Another brother, John, was a physician, and a good mathematician, and wrote on both sciences. 1 Collins, and Betham’s Baronetage.